Rev. 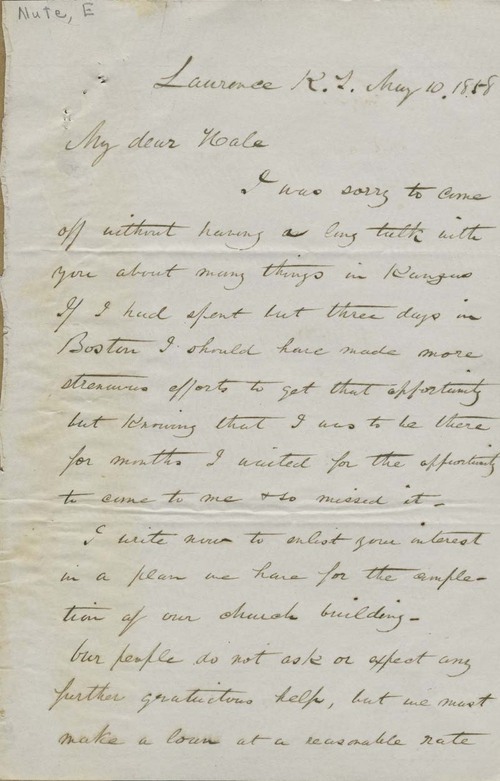 Ephraim Nute, minister of the Lawrence Unitarian Church, wrote from Lawrence, Kansas Territory to Edward Everett Hale, a member of the New England Emigrant Aid Company's Executive Committee. Nute inquired about the possibility of Hale arranging a loan of $2000 at reasonable interest for the completion of the Unitarian Church in Lawrence. He reported on the high rates of interest being charged for loans in Kansas Territory and on the general effects of the panic of 1857 on the territorial economy. Nute also expressed his dissatisfaction with the Buchanan administration's handling of the Lecompton Constitution and his hope that a change in presidential administration in 1860 would result in Kansas' admission as a free state.